With the blazing heat of the summer, nothing is more refreshing than having a cold drink while soaking up sun rays. Lemonade is a delicious go to, but summer is about being adventurous! 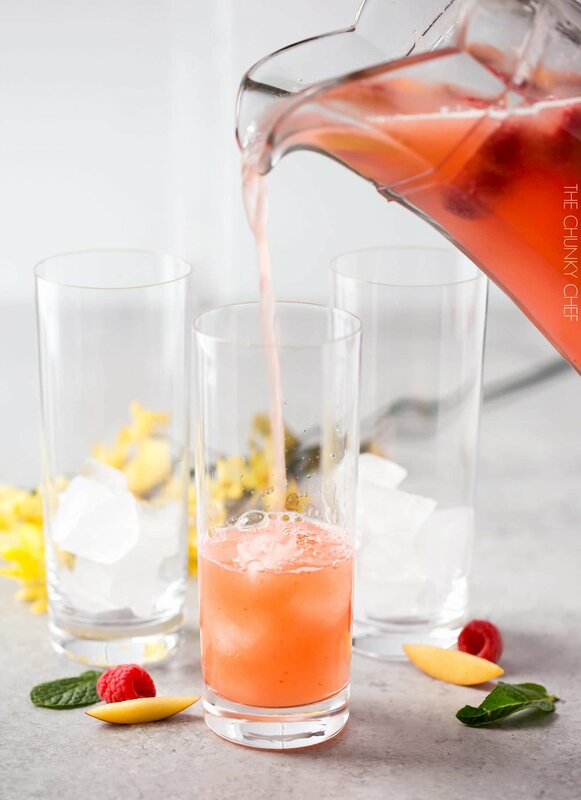 So, here’s a fresh twist on the classic beverage using peaches and raspberries from The Chunky Chef! Start by adding all the ingredients for the raspberry peach puree into a blender or food processor and blend them until it’s the same consistency as a puree. Place a sieve over a mixing bowl and pour the raspberry peach puree on top. Then use the back of a spoon to push the puree around, making sure the liquid falls into the bowl and the seeds are left behind on the sieve. Discard the seeds on top of the sieve and leave the mixing bowl aside for a moment. Add the simple syrup ingredients to a small saucepan and heat on a medium heat until the sugar has dissolved into the water, make sure to stir occasionally! Boil this for around three minutes and it should start to become a syrupy consistency, then set it aside to cool. In a large pitcher add the lemonade ingredients and stir till combined. Then pour in the raspberry peach liquid and cooled simple syrup and stir again until everything is combined. Store in the fridge until you serve it, feel free to garnish it with raspberries, peach slices, or mint leaves for an added flair!